We live in the small seaside town of Skegness, and since an operation on my lower back (fused my spine after years of pain) I’ve been working on improving my fitness through walking around Skegness. Currently built up to around a mile or so walk a day, can finally get to the beach and back, which is much better than just walking around the block. Since my back (whole body) tends to hurt less late evening/night I’ve found we are tending to go for my daily walk at night in the dark sometimes. Skegness is a typical small town, lots of small shops with a splattering of large shops like Tescos and Morrisons. Over the last few months as a family (Mum, Dad (me) and two youngest sons aged 15 and 12 years) we’ve become increasingly irritated (especially our 12 year old son) at the number of lights left on in shops and businesses within Skegness that really don’t need the lights on at night. A quick example which is directly outside where we live is Morrisons. Morrisons closes at 8pm at night and the car park is pretty much deserted by 10pm strongly suggesting no one is working late at night. 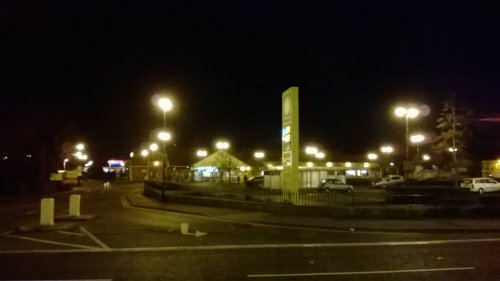 Despite this every single night Skegness Morrisons is lit up like a Christmas tree, I don’t think they ever turn the lights off (lights on 24hrs a day)! This is a supermarket set back from the main road, so there is no passing trade that might happen to glance in a shop window and think, “ooh, 2 for 1 offer, I’ll buy some beans tomorrow”. So other than maybe security (which we feel is a false argument: will make a separate post on this) there’s no good reason for leaving the lights on and wasting so much energy. Multiply this by all the Morrisons supermarket stores, according to their website over 350 stores and that’s a LOT of wasted energy just on lights at night! Morrisons store lights on at night (10pm to 6am) energy usage alone has to be equivalent to the the cost of lighting a small village! Complete waste of energy which we as consumers are paying for in higher food bills. About the only valid argument a business could have for leaving lights on through the entire night is security, but I think that’s a poor argument. So we’ve been discussing what we can do to persuade businesses/shops to turn lights off at night. Hence this article, feel free to comment below with your ideas and thoughts. I wonder how much gas and oil is wasted each year generating electricity just due to businesses leaving lights on at night? Only to have all the people at the bottom of the pile having to pay for their pure greed. The most effective way of ‘instantly’ reducing electricity output is this. Turn the street lights on 5 mins later and turn them off 5 mins earlier. Also, having motion sensor lights in buildings not only saves energy but also BLATANTLY alerts security as to the location of a possible intruder. I couldn’t agree more. I have recently moved to the US from India, and was shocked to see this blatant misuse and waste of electricity. I can’t even imagine what purpose it serves. There’s gotta be a way to spread awareness about this. This is true. Even for an hour that you turn off all electricity, it has a huge effect and it allows you to save a lot of power. We also have lots of business establishments that leaves their lights as well as other electronic device turned on even at night. Meaning, its on 24 hours daily. I really hate it when I see these things. It pulls as closer to the edge. If were planning to save the environment, we should also include this. I guess there’s no problem if you open that issue up to the government. You’re just concern with the energy and definitely it affects the town when you waste it. First, the consumption is higher than what it should be and it may cause often brownouts later on. To save it, I think you first must convince the government who controlled the town and let them implement a policy regarding that issue. It will be a big help to the citizens, for sure. I can understand the upset and irritation. Having owned businesses, I will say that many do it for safety reasons. Some businesses will turn off half the light banks, which uses less electricity. I think that is a better way to go in this situation than leaving them all on. The idea of using motion sensors sounds good as well. Then lights could go off at night or just leave a few key ones on. In the businesses that my family has owned and managed, we all have turned the lights out at night. Should You Get an E-Store for your business?